The New York State Department of Transportation will retain $14 million in federal funding after reaching a compromise with the Federal Highway Administration over the large blue tourism signs that line the state’s highways. The signs, printed with messages such as “I Love New York” and “Pathways Through History,” have been the subject of ongoing deliberation between the agencies for months. In February, FHWA sent a letter to New York transportation officials saying the agency would dock $14 million in funding from the state unless the signs were removed by Sept. 30. NYSDOT announced Sept. 28 that it had reached an agreement with FHWA to launch a new sign campaign and hold on to the $14 million. Under the compromise, most of the 514 signs will be relocated to other attractions, such as parks, historic sites and rest areas. Signs that designate regions, known as motherboards, will remain in place. In a joint statement, New York’s Transportation Commissioner Paul Karas and Executive Director of the Thruway Authority Matthew Driscoll said NYSDOT struck a deal with FHWA to review the road signs’ impact on the traveling public. FHWA spokesman Mike Reynard confirmed that the agency has agreed to examine the signs’ effectiveness and restored the funding that was in peril. FHWA initially asked for the removal of the signs because they violate regulations outlined in the Manual on Uniform Traffic Control Devices. The agency has claimed the signs are potentially hazardous because they contain too much information and could distract drivers. 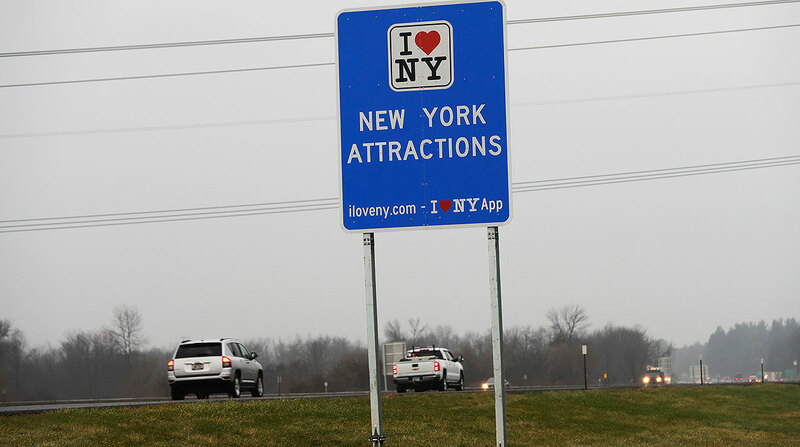 Besides highlighting nearby attractions, the signs list the addresses for the state’s tourism website and the I Love NY app. Since 2014, New York has spent more than $8 million to install the signs, despite FHWA forbidding the state from doing so. The signs are posted along major routes, including interstates 81, 87, 88 and 90. Members of New York’s trucking community have been ardent opponents of the signs. Kendra Hems, executive director of the Trucking Association of New York, said the signs have overwhelmed and distracted truck drivers. Hems said the number of signs creates a sense of “sign fatigue” for truck drivers, which can prompt them to rely on GPS or Google Maps instead of road signage that includes pertinent details such as bridge height. The height of a bridge is important information because it lets truckers know if they can safely pass under a span without hitting its underbelly. Bridge strikes are particularly common on Franklin D. Roosevelt Drive in Manhattan and the Belt Parkway in Queens, according to a report from New York’s Regional Bridge Strike Task Force. Hems said the hundreds of signs that provide neither directional guidance nor safety messages desensitize drivers to the signs that contain important information. According to Hems, a modified sign that provides specific directions to local food sources and entertainment venues would be an improvement from the current situation. She also said that funds could serve a better purpose if they went to road projects instead of signs. The signs have not resulted in a total boondoggle, however. The NYSDOT statement reflects that the signage campaign has driven the tourism industry to over $100 billion and created approximately 1 million jobs. Maintaining tourism’s economic success will remain an important part of the state’s updated sign campaign.